having worked in the grocery industry for too many years, at work the other day i was wondering how i could use my job to promote band aids. a common complaint from customers is that their bag is too heavy or their bag ripped on their way out. so i tried a little experiment of my own. 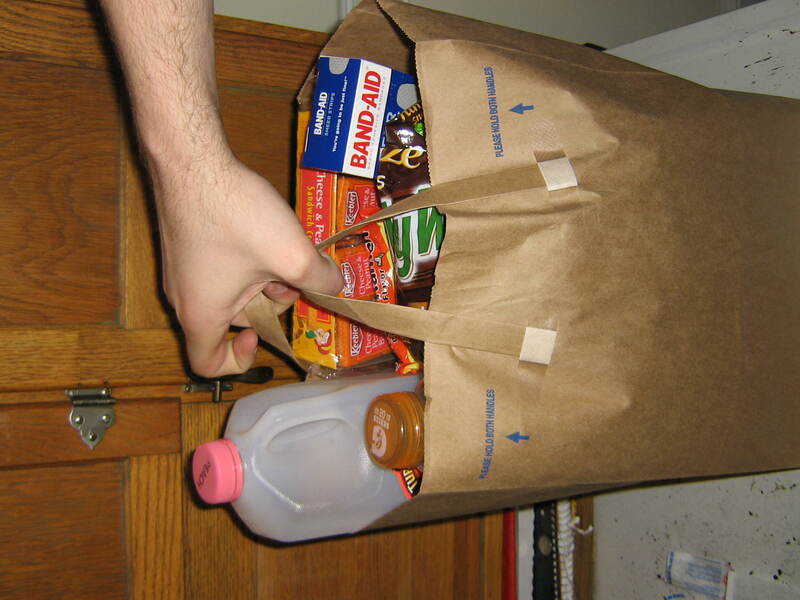 i found an old paper bag and found as many grocery items around the house that i could fit in the bag. of course i found a band aid box to throw in there as well, conveniently at the top because it is a lightweight item. i was actually surprised when the bag held up, it was pretty heavy and the band aids really did the job. after the picture i tried lifting the bag without the band aids on and the handles ripped off. so my grocery store philosophy is if you are concerned about your paper bag ripping… reinforce it with a couple band aids. as you can see it is proven to work! !